The Walter S. Cohen High School Alumni Association — which fought after Hurricane Katrina to keep their alma mater from being merged with another school — is raising concerns about declining test scores under its charter operator and plans for a new high school building they believe is too small. New Orleans College Prep, which operates Cohen, received word in the spring that the construction of a new Cohen High School on the same site would be one of the final building projects undertaken by the Recovery School District with FEMA insurance money even as all school return to the oversight of the Orleans Parish School Board. 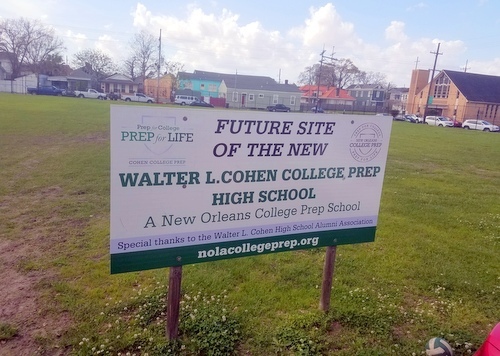 The new school will be built on the opposite side of the Cohen property as the current building, according to plans agreed upon by the Recovery School District and New Orleans College Prep, and the existing building will then be demolished after the students move. The plan would allow Cohen students to stay on site during construction, rather than having to move off site into a temporary location for the expected three years of construction. “We can compete, recruit and retain our students if we have a facility that suits our modern standards,” said College Prep CEO Joel Castro. Over the summer, New Orleans College Prep officials successfully convinced the Recovery School District to seek bids for a 110,000 square foot building — based in part in a dip in construction costs — rather than the 90,000 facility originally envisioned, Castro said. That size school would have capacity for 600 students, well more than the 350 currently enrolled, and what is considered an ideal size by many educators. The alumni association, however, believes that even 110,000 square feet is too small for all the amenities the school should have, especially because the existing school is 150,000 square feet, said association president Jim Raby, who also serves on the College Prep board. Of particular concern to the association, Raby said, is the lack of any auditorium in the plans. Stephen Boyer, another board member, said he too has been disappointed in the modern “cafetorium” plan in many public schools, and said Cohen should seek an auditorium in any future plan for the school. Based on test scores from last year, College Prep officials believe Cohen’s performance score from the state is likely to fall from a C to a D, according to an analysis presented Monday night by data director Kallistia Bilinsky. The letter grade is comprised of test scores, ACT scores, the amount of extra work such as AP classes or internships that students completed, and graduation rates. Not only did the state test scores fall, but fewer students earned an 18 or higher on the ACT, dramatically decreasing that aspect of Cohen’s core. Only the diploma quality and the graduation rates held relatively steady this year. The slide in scores is yet another turnaround for the school, which rose from among the lowest-rated schools in the city less than 10 years ago to a B rating that attracted a visit from then President Obama’s cabinet secretary for education in 2016. Castro was hired as the new CEO this spring, after the College Prep network also lost its charter for Sylvanie Williams due to low test scores, and he has replaced the principals at both of College Prep’s remaining schools, Cohen and Crocker. Raby said the gradual decline in Cohen’s enrollment is more attributable to the public’s perception of those falling scores than any new building can fix. Board member Grisela Jackson agreed with Raby that College Prep ought not to rubber-stamp a proposal that reduces Cohen’s stature. Board members Celeste Eustis and Murray Pitts, however, agreed with Castro that the loss of the auditorium is an acceptable trade-off for the benefits of a new school building. The contractors who hope to bid on the project must be certified by Sept. 5, Castro said. While the Recovery School District has made some specifications — such as the size of the school and certain amenities that must be included in it — the contractors themselves are charged with including a design for the building in their proposal, and Castro said the College Prep board may have some say in deciding which plans best suit the school’s needs. No vote was taken on the issue Monday night. Instead, board chair Patrick Norton said they would wait until the bids are returned to evaluate the proposals on the table before making any recommendations to the Recovery School District.